Kevin Gleeson and his wife returned from their honeymoon to some potentially devastating news. Their dog, who appeared completely healthy before they left, was unable to walk. The poor puppy was left with complete paralysis in all four of her legs. The couple quickly rushed their beloved pet to the veterinarian who said the condition was most likely terminal. They were told that if the dog didn’t start walking in the next three weeks, they would likely never walk again. The vet said the dog had Cervical spondylomyelopathy (CSM), or wobbler syndrome, a disease of the cervical spine (at the neck) that is commonly seen in large and giant-breed dogs. CSM is characterized by compression of the spinal cord and/or nerve roots, which leads to neurological signs and/or neck pain. Four months went by and despite physical therapy and attempts to rescue the dog from euthanasia, she wasn’t showing any signs of walking. Then — out of nowhere — a miracle occurred. 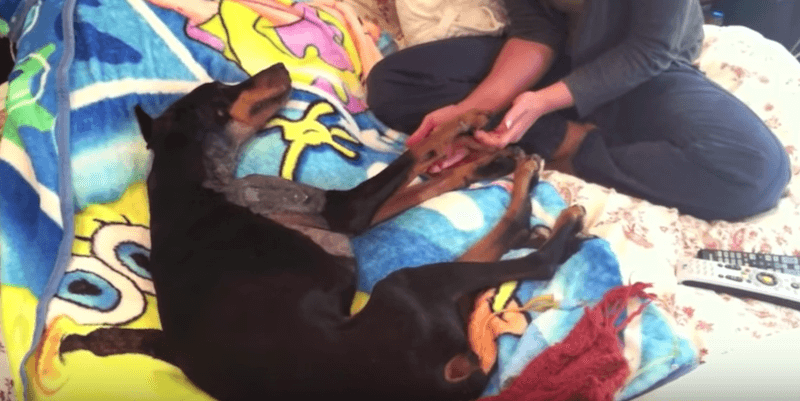 Watch as this amazing dog recovers from wobblers syndrome.